Simply stunning. 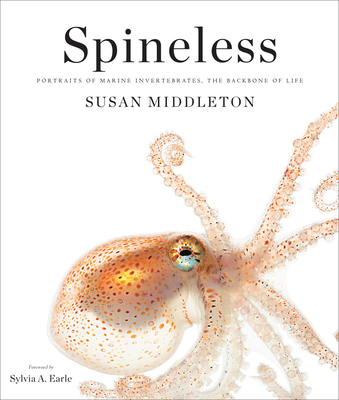 Spineless features large, high-quality photos of invertebrate marine life. From starfish to jellyfish, sea snails to squid, Middleton’s photography is breathtakingly vibrant, with descriptive insights into each animal’s world and behavior. Not your average coffee table book, this one will fascinate for hours at a time. Susan Middleton is an acclaimed photographer, author, and lecturer specializing in the portraiture of rare and endangered animals, plants, sites, and cultures. For thirteen years she was the chair of the Department of Photography at the California Academy of Sciences, where she now serves as research associate. Her most recent book is Evidence of Evolution (Abrams 2009). Previous books in collaboration with David Liittschwager include Archipelago, Remains of a Rainbow (National Geographic), Witness, and Here Today (Chronicle Books). Her photographs have been exhibited worldwide in fine art and natural history contexts, and are represented in the permanent collections of the National Academy of Sciences and the National Gallery of Art. She was awarded a Guggenheim fellowship in 2009. She lives in San Francisco. A gorgeous, light-drenched book that treats the senses. In one exquisitely-crafted portrait after another, accompanied by stirring prose, Middleton reminds us that we share the planet with equally fascinating neighbors, some of whom just happen to live beneath the waves.